I've been undertaking more work on my bloodstone knights recently, and so the idea of assault has been on my mind much more. Here's a few thoughts I've had on the comparison between assault and shooting. 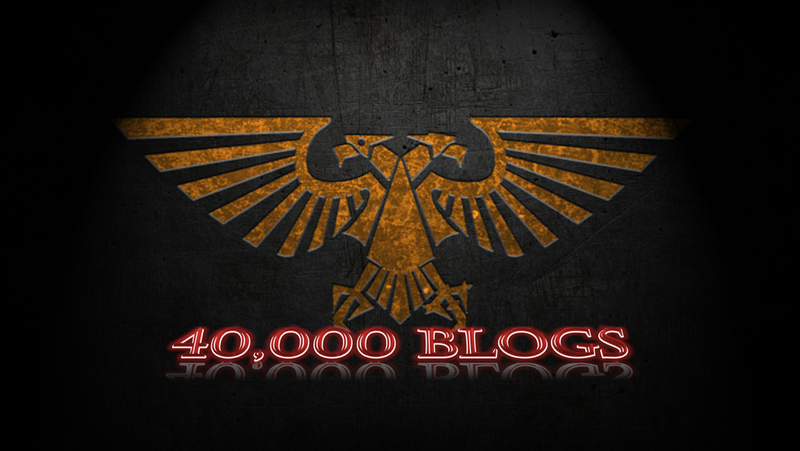 40k is a game set within a futuristic setting, albeit one where any form of technological progress has stagnated. The first thing that springs to my mind when I think about 'sci fi' is 'will the guns look cool'. Taking a few examples, some really good looking guns are the morita from starship troopers, Han Solo's pistol, and of course, the space marine boltgun. 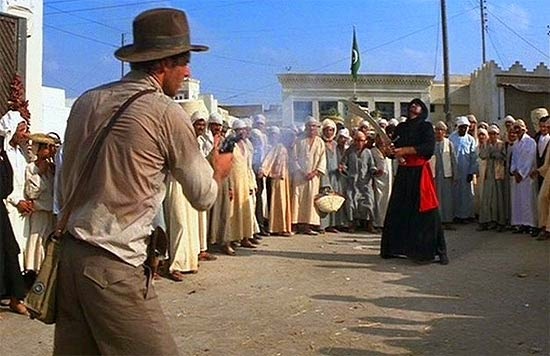 At the other end if the spectrum we have (all) the guns from Blake's 7, the rifles from Flash Gordon, and those carried by the clones in Star Wars episode 2. There's just one problem there (at least in terms of the tabletop wargame), and that's that if you take away all the variety in terms of method of killing stuff, you end up with two armies that will just sit on either side of the board flinging ammunition back and forth between them, and the only variety becomes how many guns you have and how powerful they are. Add in armies that don't have a huge number of guns however, relying instead on killing things within arms reach, and all of a sudden you have movement in the game, with some units hell bent on all-out attack, racing across the table at full speed, whilst their opponents try to bring enough firepower to bear to stop them getting close. Much more exciting and cinematic. 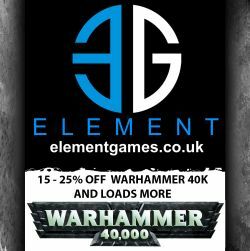 I have a certain amount of sympathy here with the GW design team who write the rules, because balancing so many different armies and play styles cannot be easy when the codex release schedule is also so staggered. That's not to say however that I think they got that balance right in this edition, but I don't think it's as broken as it seems. I can think of two main issues, the first being getting units into combat without them being so decimated by the time that they get there they don't have enough attacks to cause significant damage. The second issue is that units that you expect to be good at combat aren't as effective as their background would suggest. This is exacerbated even more by armies without assault transports - take howling banshees for example, their transport option is the wave serpent, but the banshees must stand around getting shot (or counter charged) for a whole turn before they can even think about charging, and any player with half a brain is going to be moving his units away from them once they're on the table. Let's take for example a unit of dark eldar wyches, which should be good at combat according to their background, and do a quick check. Let's also assume they get into combat unharmed against a squad of marines (unlikely I know, but bear with me). Each wych will have three attacks, so 15 that should hit home, of which 5 should wound, causing 2 casualties. In return the marines should hit with four attacks, also killing 1-2 wyches, whose efficiency drops in the next turn thanks to fewer attacks. Of course in reality, overwatch kills two, and a turn of shooting before that (outside rapid fire range) takes down 4, reducing the wounds caused to 2, which could easily both be saved by marine armour. Against a softer target however (guard) those 30 attacks result in 20 hits, and ten wounds, or 6-7 dead. That would be a won combat and a likely wiped out unit, though you still have the issue of overwatch and shooting beforehand. So in the wyches case, it's their strength that really causes them problems. Go up against a unit of bikes for example, and only wounding on '6's makes them really worthless. Now here's where I try to correct things, and I'll take the wyches as my example. There are two ways of achieving a greater result for them in combat against marines. The first is to limit the maximum save an opponent may take, and in some instances (for example choppas and chainswords) that approach makes a certain amount of sense. It shouldn't be universal though, and particularly in this case, making their attacks poisoned (4+) just nudges the marine casualties higher without impacting on their performance against guard. Of course taking that one step further and making their attacks poisoned (3+) is even more true to the background, and would help to compensate for the likely casualties beforehand. I don't claim to have all the answers, but it seems to me that combat can be rescued without wholesale rules changes, with a lot of the necessary amendments capable of being addressed in codex entries. Assault can, and does, work in this edition, but the rules are such that in order to make that the case, you need to focus on it almost to the exclusion of all else, and very few armies can do that.